The house is 65sq m, in a complex of 4 houses built in 2010, following 100% local architectural line. 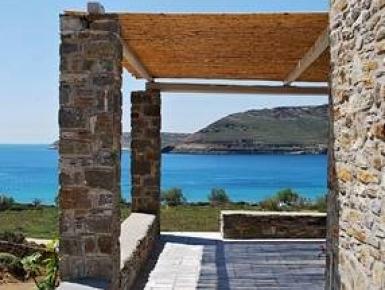 Facing the sea and all covered from north winds, but still getting the refreshing breeze, it is an ideal place to relax and enjoy the magic of Greek waters, sun and meltemi wind. A big bamboo roofed balcony has all the great view, where you can dine or relax on a long chair or a swing and enjoy the sea view in the morning, the romantic sunset in the afternoon and the star bright moonlit sky at night. Accommodation: One bedroom with double bed (140 cm), one bedroom with two single beds, two bathrooms may comfortably host four persons. On the upper floor, a salon with a sofa facing the sea, next to the equipped kitchen. A washing machine and air conditioning complete the utilities. The house is available April-October for seasonal or weekly stay.